Mary "Polly" Walling was born in Pike County, Mississippi on November 4, 1818. 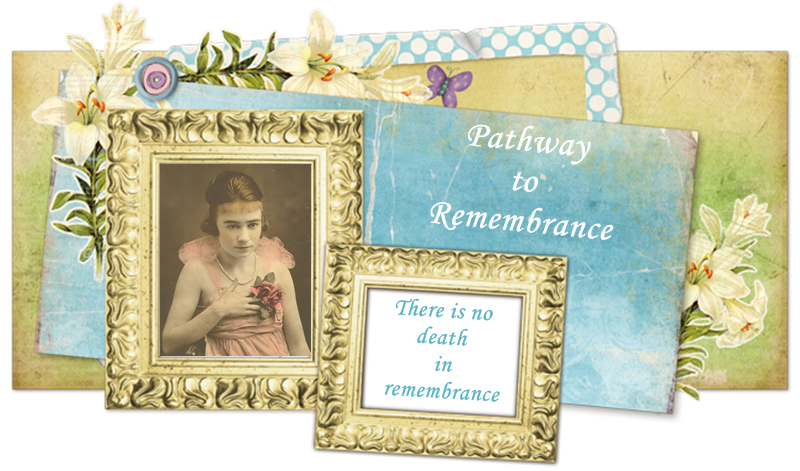 She was born to the marriage of James Walling, Sr. and Martha Hamlin. 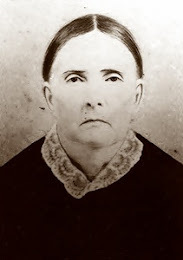 Mary "Polly" was a sister to Lucinda, Vance, Ann, Elizabeth, James, Jr., and Sarah Walling. 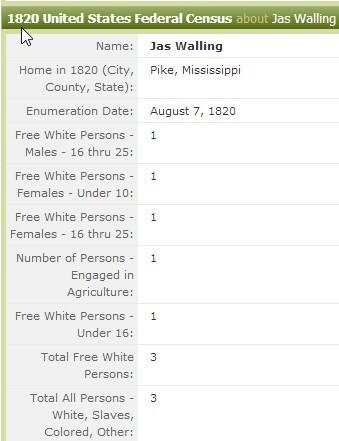 The 1820 U. S. Census shows James, Martha and Mary "Polly" Walling living in Pike County, Mississippi. 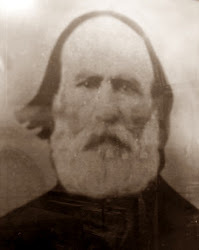 The Wallings moved from Mississippi to Texas after 1820 and prior to 1840. 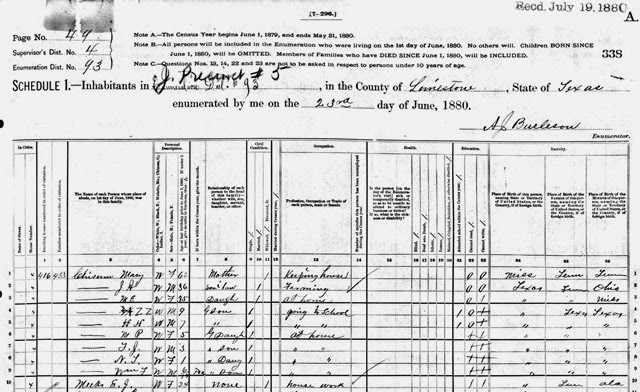 The 1840 Texas Tax List shows James Walling living in Nacogdoches County, Texas. 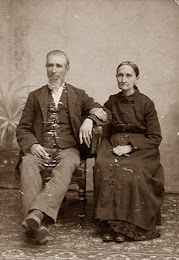 On May 21, 1840, Mary "Polly" Walling married Isham Russell Chisum in Nacogdoches County, Texas. Mary "Polly" and Isham Russell Chisum had eleven children while living in Nacogdoches County. 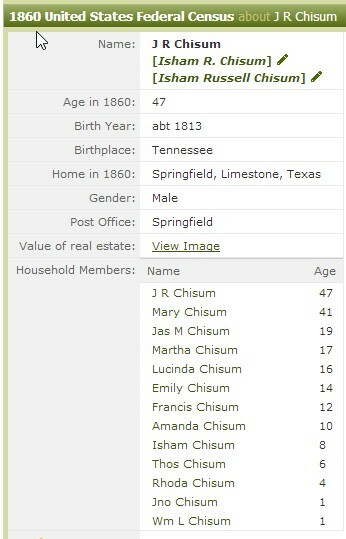 By 1860, the Chisum family was living in Limestone County, Texas. 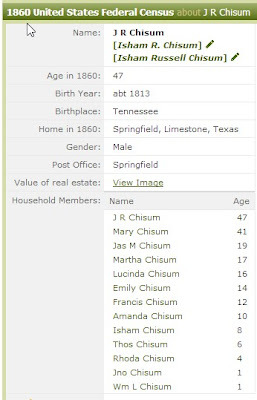 Following the death of Isham Russell Chisum in 1861, Mary "Polly" and children continued living Limestone County. 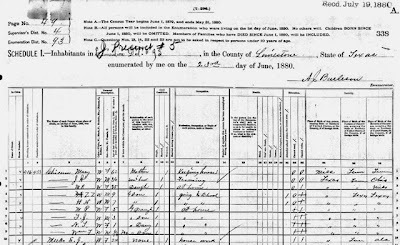 The 1870 U. S. Census shows Mary and three of her children, Isham Russell, Jr., Thomas Jefferson, and Rhoda living in the same household. 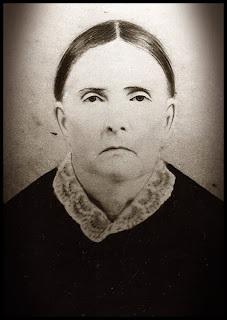 E. J. Meeks (female/widowed) - possibly related through Mary "Polly" Chisum's daughter Martha who married William Meek/Meeks. 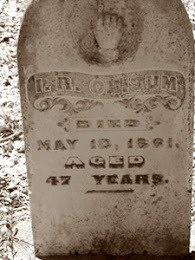 Mary "Polly" Walling Chisum died on January 18, 1891. 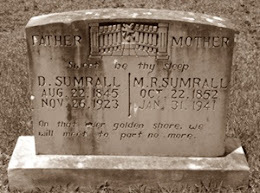 She is buried near her husband in the Tidwell Cemetery in Thornton, Limestone County, Texas. 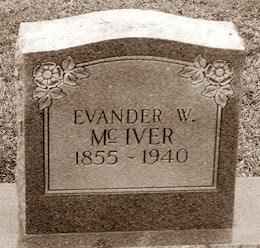 Tombstone photograph was taken by FindAGrave member, Alford. 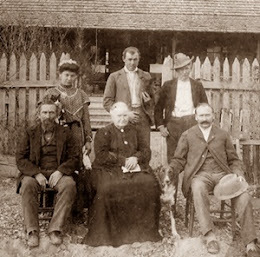 Mary "Polly" Walling Chisum was one of my paternal great-great-great grandmothers through her daughter, Lucinda Chisum Steele; grandson, Isham Alfonso Steele, great granddaughter, Mary Allye Steele Edmonds; great-great grandson, Bruce Alfonso Edmonds. 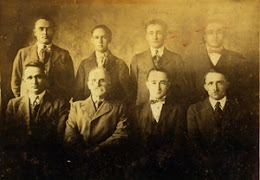 Always nice to find more cousins! Thanks for taking the time to leave a comment.